Perhaps it’s because women are still vastly underrepresented in many of the sciences at tertiary level. The OECD reported that in 2012 only 14 per cent of young women entering university for the first time chose science-related fields compared to 39 per cent of young men and, within these science-related fields, enrolments are quite skewed, reflecting long-held beliefs about ability. Overall, young women represent almost half of the enrolments in the natural sciences; however, this is predominantly in biological and environmental sciences, in which more than half of the enrolments are females. In the physical sciences, young women make up about 38 per cent of enrolments, dropping to 25 per cent in mathematics and statistics. In other STEM related fields, young women make up 22 per cent of the enrolments in engineering, and just 19 per cent of the enrolments in ICT (OECD, 2018). These enrolments reflect the decline in participation in mathematics and the sciences at secondary school – across the country enrolments in such have declined, and they declined from a low base. This article addresses three broad areas that may hold females back from participation in these subjects in school and in entering STEM careers, providing teachers with the knowledge to address the underlying issues. While this is one that has had some traction over the years, it has been widely refuted by research. For example (and there are a great many others), in a meta-analysis of 100 studies on mathematics performance involving more than three million students, Janet Shibley Hyde and her colleagues found no large differences in achievement between males and females (Hyde, Fennema & Lamon, 1990). Our own current Australian data for the international assessments shows mixed results. 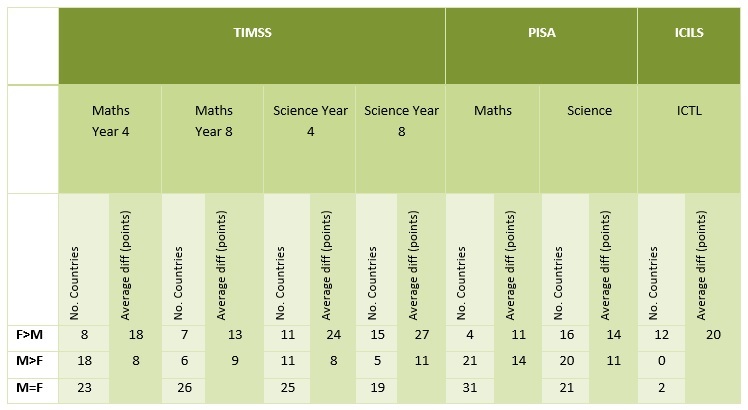 In the Trends in International Mathematics and Science Study (TIMSS) 2014, there was a small (but significant) gender difference of nine score points in favour of males at Year 4 level. This was the first time a gender difference has been in evidence at this year level, and bears monitoring. There were no gender differences found in Year 8 mathematics, nor in science in either Year 4 or Year 8. In the Programme for International Student Assessment study (PISA) 2015, there were no significant differences between Australian male and female students in either mathematics or science. In the International Computer and Information Literacy Study (ICILS), however, females outperformed males by a significant 25 score points, on average, although males outperformed females on some of the more advanced topics. Internationally, the data from all three studies show varying differences. Table 1 shows, for each study and each STEM area, the number of countries in which males outperformed females, and the average number of score points in each case. The number of countries in which there were no gender differences is greater than the number with gender differences in all studies other than ICILS. The only clear pattern otherwise seems to be that when females achieved at a higher level than males, they generally did so by bigger margins – only in PISA maths did males outperform females in more countries and by a larger margin. However, in ICT literacy, females outperformed males in 12 of the 14 participating countries by a substantial margin. Conclusion: if mathematical, or scientific, or computer ability were biologically determined, gender differences would be consistent across countries. This is clearly not the case. Gender differences in both self-confidence and self-efficacy have been shown to have a profound effect on attitudes to studying mathematics and science both in secondary school and at tertiary level. In TIMSS, students are asked a series of questions tapping into their self-confidence. In mathematics in Australia in both Year 4 and Year 8, males were significantly more confident of their abilities than females. While confidence levels for both male and female students decline significantly between Year 4 and Year 8, just 11 per cent of female students compared to 19 per cent of male students say that they are 'very confident in mathematics'. At the other end of the spectrum, again at Year 8, almost half (49 per cent) of the females surveyed said they were 'not confident in mathematics', compared to 36 per cent of males. In science there is a similar decline in confidence between the year levels, and in Year 8 just 14 per cent of Australian female students compared to 20 per cent of Australian male students express such strong levels of confidence. However, 45 per cent of female students and 40 per cent of male students expressed no confidence in science. The self-efficacy component asks students something a little different: whether they believe they will be able to complete a particular mathematical or scientific task. In PISA, students were asked about mathematical self-efficacy in 2012 and scientific self-efficacy in 2015. Their responses were combined into a scale which was standardised to a mean of 0 and a standard deviation of 1. In mathematics, male students reported significantly higher levels of self-efficacy than females in all countries. The gender difference in Australia was the largest internationally, around 0.4 of a standard deviation. In science, the findings were less definitive; however, in 39 of the 70 participating countries and economies, males had significantly higher levels of science self-efficacy than females. While the OECD point to countries such as Denmark and Germany with very large gender differences (of around 0.37 of a standard deviation), those in Australia were also substantial, about 0.25 of a standard deviation. The self-efficacy score for Australian males was substantially and significantly higher than the OECD average, that of females significantly lower than the OECD average. PISA found that students who have low self-efficacy in science (or mathematics, or computing) do not perform as well as those who are confident in their abilities to use their skills, and the gender gap in science is related to the gender gap in achievement, particularly amongst high achieving students. Conclusion: male students show substantially higher levels of both self-confidence and self-efficacy than female students. Both are necessary in order to pursue more challenging levels of mathematics or science. There are many pervasive cultural beliefs about STEM subjects ­– particularly mathematics, the ‘hard sciences’ such as physics, and IT – being male domains. Indeed, most of the people working in these areas are male. But this is self-perpetuating, and needs to be challenged by parents as well as teachers. These beliefs may be explained by some evidence from the 2012 PISA parent survey, when parents were asked about their expectations for their children’s careers. In every country surveyed, parents were more likely to expect their sons, rather than their daughters, to work in STEM fields, even when males and females performed at the same level in mathematics. Conclusion: The literature suggests that female students’ lack of confidence may be due to a lack of female role models in STEM areas. The lack of women in science, mathematics and IT provides little in the way of tangible evidence to disprove the stereotypes. Females, as well as males, need to be taught, by teachers and parents, that working in a STEM field is not necessarily the domain of a brilliant few, but that most scientists and mathematicians and IT professionals are simply hard-working people, both male and female. Hyde, J. S., Fennema, E., & Lamon, S. J. (1990). Gender differences in mathematics performance: a meta-analysis. Psychological bulletin, 107(2), 139. On the other hand, about 50% of medical students in Australian universities are women, and medicine is a well-paid STEM profession. I did all the right things for a STEM career at High School and University. Because I married, early I ended up finishing my University degree at another university after working as a clerical officer with a government department for a number of years. In the end I attained a B.Sc in mathematics. Then I got a job with the Bureau of Stats in a technical area writing analysis software - which was fantastic until I ended up on maternity leave. So I volunteered in a school eventually and ended up working in a school library and am still here almost 18 years later, partly because I feel I have forgotten too much to go back to my original career. Integrating in multiple dimensions or knowing quantum mechanics does not help you change a nappy or cope with two Asperger’s children. However, maybe, at the age of almost 60 I may actually go back to University and get a Masters. And I am sure that many women in STEM careers have found exactly the same. Sometimes, following the role of wife and mother conflicts with career. Yes, I am disappointed, but the world has not changed (despite people telling us so) and we still have the same expectations for women - that to manage a career and be a wife and mother you may indeed be a “superwoman”. My conclusion is that we need strong female role models and I did indeed have these, but we also need career plans for these young women to allow them to contribute in equally in a still male dominated world. This is what we do not have. Interesting article. Is there any research on who is teaching maths and STEM in our schools? From a quick ‘mental survey’ of my 30 years in secondary and VET education and the experiences of my grown up girls in their schooling I can only identify a very small number of female STEM teachers, female STEM leading teachers etc. Typically in my daughters primary school the (rare) male teacher took the ‘top maths set’. Lots of opportunity to look in more detail at what is actually happening in our schools and to work to change these biases.